This is a "modern-er" version of The Prince and The Pauper and I for one, really enjoyed it. The characters are female instead of male, but being set in the early 1900's I think that gives it the added twist that the girls really don't have control over their lives anyway. 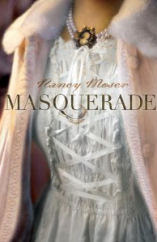 This is the second Nancy Moser book I've read and I really appreciate how she writes. You get a feel for the time period with all the detail she puts in. It's not overwhelming, but it really helps you create the scene in your mind rather than the plot being able to be set in any time period. Both my mom and I felt that the first half of the book is a bit slow, but once you get into it you just can't put it down! Love Moser! Saw a review for this pop up yesterday but I like how you likened this to a modern retelling of The Prince and the Pauper. I can see that. I look forward to reading this one!